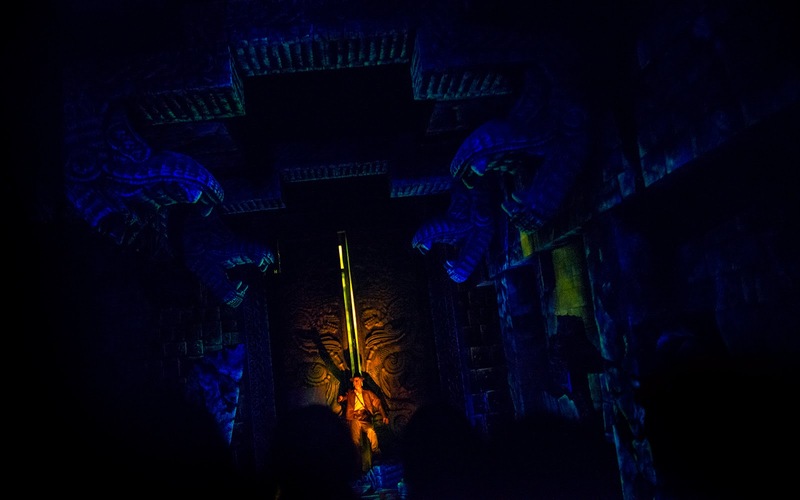 It's always a challenge shooting an Indiana Jones Adventure ride. The bumpy and jerking motions make still shots practically impossible, which means one needs to have camera that can take dark shots with relatively quick speed and focus in a cinch. The result, most of the time, seems to be a lot of blur, with an occasional shot in focus. Well, here is one such occasional lucky shot, where Dr. Indiana Jones tries to hold back the gates of an unknown force. Turns out temple spirits don't like it when you trudge into their domain. Who'da thunk? Indiana Jones tries to prevent supernatural forces from escaping the Temple of the Crystal Skull.